NIOSH has released a new report that can help occupational safety and health practitioners conduct improved posture assessments in the workplace. The assessments can be used to help prevent and control occupational musculoskeletal disorders (MSDs). Observation-Based Posture Assessment: Review of Current Practice and Recommendations for Improvement describes a research-based approach for assessing torso and arm posture. It also discusses enhancements including digital video, computer software, training and the use of visual cues. 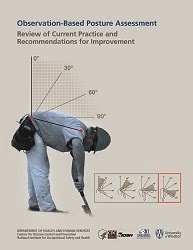 IN addition, it provides general guidelines for video recording and analysis of workers’ posture. The report is a joint effort between NIOSH and the Canadian Centre of Research Expertise for the Prevention of Musculoskeletal Disorders. Record the task from multiple views and encourage the worker to avoid loose-fitting clothing. If possible, shoot one of the views perpendicular to the plane of the joint movement. Zoom in on limb segments so the joint of interest is as large as possible on the screen. Read more and download the NIOSH report here. Browse Lifting and Back Belt safety signs here. Observation-Based Posture Assessment: Review of Current Practice and Recommendations for Improvement describes an observational approach for assessing postural stress of the trunk and upper limbs that is intended to improve risk analysis for prevention of musculoskeletal disorders.